John Dunning is helping make vinyl records cool again and is breathing life into the old Penn Theater. Through the years, John Dunning has been a purveyor of antiques and lover of music. Funny, how his two loves married a few years ago. 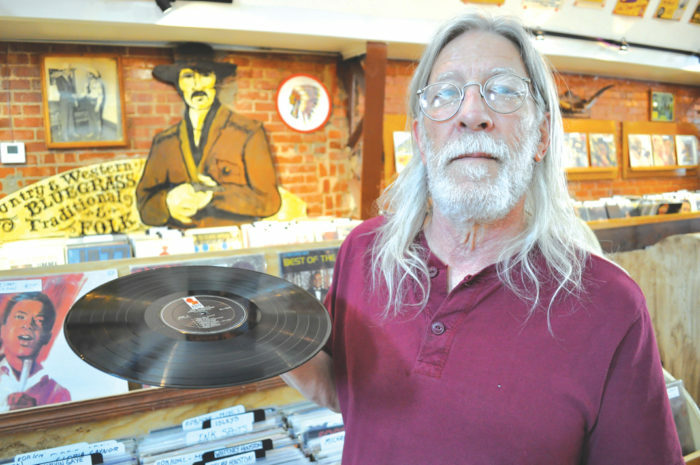 Now, Dunning runs Trolley Stop Records, 1212 N. Pennsylvania and is feeding the metro’s resurgent appetite for vinyl records. A story in Forbes magazine noted that since 2009 the vinyl format has experienced a 290-percent increase in growth. You’ll find CDs at Trolley Stop but they’re relegated to the back. There’s no doubt vinyl is the star of the show here. “To me the unusual thing was back in the 80s CD’s put vinyl out of business pretty much,” he said. “But now it’s kind of flip-flopped and records are putting vinyls out. They’re not making the CDs as much and Best Buy and Wal-Mart, they’re dropping CDs. Trolley Stop contains just a fraction of the vinyl Dunning has collected over the years. He’s got a warehouse that he keeps adding to. It’s one of the reasons he’s now on Penn. Dunning arrived to the Penn Theater a year ago this past April with nothing but a cement floor to greet him. Wooden record cabinets and a stage were created. By late July Trolley Stop was open for business and the old location at 18th and Classen was shuttered after a seven-year stay. Since then a number of bands have graced the stage. “I was just wanting a bigger venue and was driving around town and they had a big For Rent banner hanging,” Dunning said. There’s a low-key vibe at the Trolley Stop. Dunning and his wife, buy and sell. Rescue dogs litter the floor here and there, oblivious to the customers most of the time and then sauntering up for a scratch behind the ears other times. Born in 1951, Dunning is now a visionary for a technology that appears to be sweeping the nation – again. And Dunning is there to sell them all back to them. An artifact, a sampling of art and a piece of of history all come packaged with unforgettable sound. One of the big things Dunning has noticed the last few years is how families come in together. There’s the little ones, the tweens and teens, moms and dads and the grandparents. The format almost disappeared in the early 2000s. But then it caught fire again. Like most people, Dunning watched the Beatles on Ed Sullivan. “That got me going,” he grinned. Right after in 1964 Dunning went to the Municipal Auditorium and saw the Dave Clark Five. Trips to see Jimi Hendrix, Janis Joplin, Led Zeppelin and other bands most people wish they could see followed. Dunning spent the 1970s living in a commune in Oklahoma City. Yes, he’s a hippie and proud of it. He was responsible for helping bring more live music to the metro with the construction of the Prairie Lady concert hall. Now, he’s teaching a proverbial master’s class to those falling in love with vinyl all over again.